Update: After a 1000 point plunge in The Dow, President Trump has found a scapegoat. After The White House put out the calming statement (below), President Trump told reporters that "it's the correction that we've been waiting for a long time." “The Fed has gone crazy,” he told reporters on Wednesday as he arrived in Pennsylvania for a campaign rally. “So you can say that well that’s a lot of safety actually, and it is a lot of safety, and it gives you a lot of margins, but I think the Fed has gone crazy. I think the Fed is making a mistake. They’re so tight" Trump said, adding that he "really disagrees" with the Fed raising interest rates. 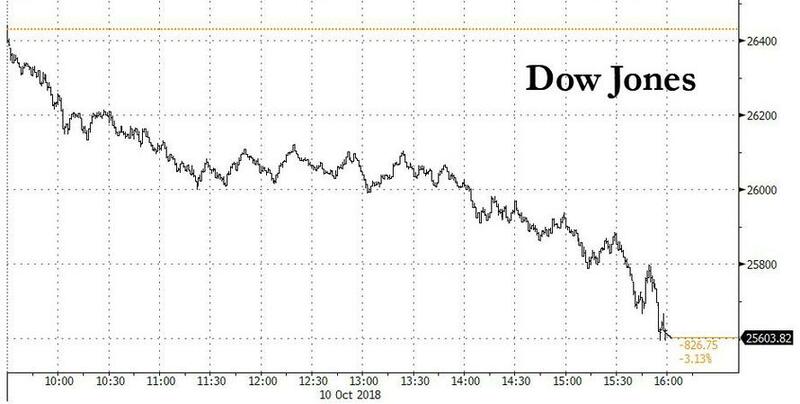 As we noted earlier, "what better justification could Trump have to "push" Powell than to accuse him of the second worst selloff of 2018?" Earlier, White House Press Secretary Sarah Sanders said in a statement following the close of markets that the U.S. economy is “incredibly strong” despite the selloff, which analysts attributed in part to trade tensions with China. 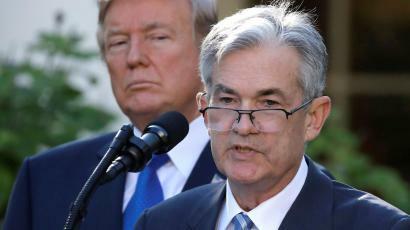 Of course, if the economy was indeed so strong, then the Fed is likely behind the curve and has to hike even more, but that nuance was lost on the president who is now just setting the stage for Powell to become the fall guy when stocks crash. It was just on October 3 that Trump, gloating in the warm glow of a new all time high in the S&P tweeted that "The Stock Market just reached an All-Time High during my Administration for the 102nd Time, a presidential record, by far, for less than two years. So much potential as Trade and Military Deals are completed." Fast forward just 1 week when things are decidedly less glowing, and on a day in which the VIX exploded, the Nasdaq tumbled 4%, the S&P slumped below all key support levels, and the Dow plunged more than 800 points, its worst day since February in a Black Wednesday for tech stocks, there is far less cause for celebration. In fact, according to CNBC's Eamon Javers, Trump was briefed on the market sell off this afternoon. And while Trump will most likely not tweet any celebratory message today, a senior White House official give Javers the following comment: "This is a bull market correction. It’s probably healthy. This will pass and the US economy remains strong." So who was behind the selloff: deleveraging risk parity funds? Selling CTAs? A wholesale derisking into a higher interest rate environment. Or... could it be China, with its $1.5 trillion in reserves sending Trump a clear message what could happen if Trump continues to unleash hell in Beijing's general direction? While it is unlikely that the culprit will be revealed, there is nothing that would prevent Trump from pushing the former narrative and blaming Beijing for today's rout. That said, there is one more person who should be rather nervous after the plunge: recall that exactly 24 hours ago Trump said that he doesn't "like what the Fed is doing." What better justification could Trump have to "push" Powell than to accuse him of the second worst selloff of 2018? Indeed, as one notable fintwit member said, a little more downside in the S&P, "and Powell can start putting his coffee cups and pencils in a cardboard box."